Donald Trump insulted one blowhard overpaid news commentator. Red State, or some similarly named bastion of conservatism, or Republicanism, or whatever it's called, is sorely insulted. This is beyond the pale and we will not tolerate it! He said she was bleeding out of her eyes or whatever, and this must refer to menstruation. Therefore Donald Trump is not fit to speak at our Very Important Thing. Chris Christie says teachers need to be punched in the face, and that is just fine. After all, who cares about a few million teachers? And who cares if most of them are women? That's not misogynist. And anyway, going after labor is the Republican way. How can we help our country better than by breaking union, making it difficult to impossible for working people to negotiate, and making more money for the likes of the Koch Brothers or the Walmart Family? The truth is, it's an outrage that any of them would attack working people. What the Democrats and Republicans should be fighting about is how best to help working people. And ostensibly, that's what they're doing. The problem is they're all lying, and the Democrats are following in their footsteps. How else do you explain an ostensible Democrat running for governor and saying he's going to go after unions? But the Republicans say they're sensitive to women. That's why they banned Trump from the Very Important Thing. Now imagine all the women Scott Walker hurt when he killed collective bargaining and decimated union for all but the police, charged to protect him from the rabble. If Trump should be dropped from the conference, Walker should be dropped from the planet. 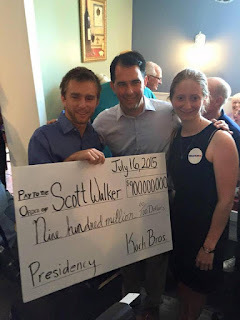 How many thousands of women have been hurt in Wisconsin by his Koch-financed actions? Donald Trump is a bloviating blowhard. He's shown himself, just over the last few weeks, to be a xenophobic, misogynistic narcissist who thinks anything he does is justified simply by the virtue of his having done it. But make no mistake, he is the true face of the GOP. He does, as he points out, say the things none of the others will say. He can't be bothered with all that political correctness nonsense. And after all, why would you want anything like diplomacy or tact from someone in charge of negotiating over things like war or nuclear bombs? Trump has no editor and he says whatever he damn pleases. For my money, Trump is the most honest of the lot. He's a straight talker. He doesn't respect women, he doesn't respect the press, he doesn't respect the people he does business with, he doesn't respect you or me and he doesn't respect anyone. But the truth is neither does Christie. And neither does Walker. And neither does Bush, who was in bed with Lehman Brothers as they were crashing our economy. I don't think any of the others do either. I'm not all that sure about Hillary Clinton either. And the AFT message, that she said this or that, doesn't resonate with me either. They said the same thing about Obama and he sacrificed not only unionized teachers but also American schoolchildren to get through the few things he actually accomplished. But we know exactly where the GOP stands, and it's quite important we push them out of our way if we ever want to get anywhere.